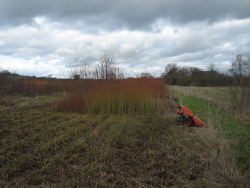 Cutting willow isn’t something to be done in bad weather if it’s not essential; we try to avoid it anyway. It’s physically demanding and is miserable in the rain but hey, we’ve got hats!The worst of it is not being willing to take a vehicle over the ground to pick up all that’s been cut so far. Actually we did yesterday but only because we’d promised willow to a customer who came today. Usually there’s a good cold spell in February, when we can get around frost-hardened fields without causing ruts. Not this year. I know we are lucky compared to some – at least we don’t have to use a snorkel to find our willow. Orders are beginning to stack up now and today’s continuous rain has meant that I’ve dealt with a load of paperwork – one good thing to emerge from the gloom.